Oh my. This is fresh and pretty. How can a salad with soft pinks and light greens and the most cooling, refreshing flavors not make you feel like the most beautiful thing alive? Apparently avocados, cucumbers, grapefruit (or gorgeously pink pomelo for us here in Asia), smoked almonds, fresh chives and mint, and a honey vinaigrette can make it happen with just one bite. Magic, for sure. Just to be clear, this is not an I’m-really-hungry dinner salad. I do love those salads (currently reminiscing about the Chopped Thai Chicken Salad) but this is not one of them. No, this is a refreshing grapefruit salad for Mother’s Day, brunches, tea parties, and hot hot hot summer days. Speaking of Mother’s Day, I can’t believe I’m ahead of schedule and posting a holiday recipe suggestion. This is weird. Usually I find out a week later that it was something like Cinco de Mayo and I should have been making guacamole and taquitos and salsa verde all week. Err, hey. That’s now. Good thing I have a million avocados sitting in my kitchen right now because there’s still time for guacamole before the clock strikes May 5, right? Another good thing: paying $1.25 for 7 gorgeous avocados. I have gone for many months without them because they haven’t been in season, but now that they’re back in season, they’re REALLY back in season. Thank you, Philippines. I’ve made this salad several times and here’s a shot from an earlier version that I made. They didn’t have grapefruit when I was making this one so I just used oranges. Still totally delicious! Even Bjork liked it. I don’t mean to say that I wasn’t expecting him to like a cucumber avocado citrus-y type salad, buuuut, I wasn’t. And he did, and so did I, and we both ate it happily. I served this pretty orange version on q-q-q-quinoa. Maybe that’s why he liked it, cause he’s into that kinda stuff. Speaking of quinoa, I feel like I’m the annoying girl who keeps talking about quinoa recipes on social media and never sharing them. I promise you one for Monday and it’s my most beloved quinoa recipe ever. Out of, like, two total quinoa recipes that I like. You can eat this however you want. With quinoa, without quinoa, on crackers, with pita chips (mmm), or like we did for lunch today: just straight up plain, out of the salad bowl, with extra almonds and mint on mine and extra avocado on his. This is fresh and yummy and I think your mom would like it for Mother’s Day because it’s pink. I’m just saying. This avocado cucumber grapefruit salad is delicate, refreshing, and crunchy with smoked almonds and a honey vinaigrette. Perfect lunch! Wash, cut, and gently toss the cucumbers, grapefruit, almonds, mint, and chives. Whisk the dressing ingredients together. Taste and adjust to your preferences. Drizzle over the salad ingredients. Chill until ready to serve. Just before serving, gently mix the avocado pieces into the salad. Top with additional herbs or almonds. The avocado starts to melt pretty quickly into the salad, so be sure to add the avocado right before serving for the best presentation. It’s best to eat this on the same day that you prepared it. Need any help polishing off those avocados Lindsay? 😉 Gorgeous salad! I see a rainbow of fruity-veggie fresh goodness, and I want to dive into the enter bowl! Love this! So fresh and just perfect! Love the fresh ingredients in this salad. I love salads with both fruits and veggies in them! This looks totally perfect for the hot weather! This looks SO refreshing and tasty! I’m not normally into grapefruit, but I want to be. Maybe tasty avocados will help convince me. Yes! Or try oranges! We loved it both ways. I have added chopped banana to this. This recipe sounds so refreshing and light! But I am distracted by the extremely long pit in the avocado…is there a different variety in the Philippines? Lol… Just a weird one I decided to photograph. The rest were already in the salad! 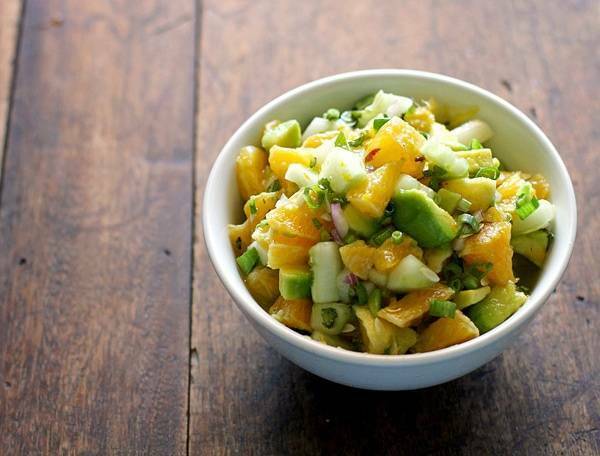 This salad looks so perfect – I love avocados and citrus together. And uh, bring back some of those avocados to the US, please? Paying $1.50/avocado is putting a serious dent in my wallet! I love how this salad is totally adaptable. I’d almost call it dessert, but it’s incredibly healthy! The colours, flavours, just everything looks so divine. Hello summer! I’m loving this!! What a refreshing combo. And the avocados are so cool with the elongated pit! Ouch! That’s a lotta money! Wow, this salad sounds so refreshing, and combines some of my favorite springtime flavors! Especially avocado! What kind of avocados are those? I’ve never seen a pit that shape. Are you going to bring that table back or leave it? It’s so beautiful. I hope you can keep it. If not, make certain someone in the Philippines is a food blogger. I want them to love it as much as you have this past year. You got SEVEN avocados for $1.25?!? Jealous. Mmm, couscous would be great! I’ve been craving something like this all day…healthy, hearty, filling, and delish! This looks so lovely and fresh! Thanks for sharing! I stumbled across your blog when I was in search of a cauliflower sauce recipe. I spent the last four days looking through your recipes and printing a bunch off for my collection. I am a teacher too and can’t wait for summer to get here so I can find more time to try some of your ideas. I’ve tried three so far, and this one is by far my favorite. I ate it over a bed of baby spinach and it was fantastic. Thank you so much for the wonderful flavors. This.is.amazing! I put it on my fish tacos! Delish & thanks! !